1 of the Morgans rescued..
On December 28th, 2012 in Harrisburg PA another sad situation was brought to the attention of officials. Harrisburg Humane Society entered the property of a local Morgan breeder and found horrible conditions for over 25 horses. Five animals were seized at that time, with strict instructions to better provide for the remaining animals. Unfortunately upon their return two weeks later, conditions had not been improved, and the decision was made to seize the remaining 24 animals. Through more support and sharing through online resources and information posted on the popular bulletin board for Chronicle of the Horse, we were able to contact executive director of the Harrisburg Humane Society, Amy Kaunas. After speaking with Ms. Kaunas, we learned the animals were in dire need. 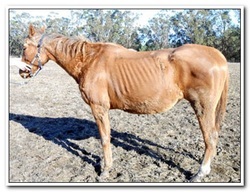 Not having been properly cared for, nutritionally neglected, without shelter, farrier work, dental work, or any veterinary care, the animals need some serious help! We’re proud to announce that with the help of the Harrisburg Humane Society, and members of Leg Up, we were able to provide a donation that will hopefully help alleviate some of the cost of caring for 29 needy Morgans! The donating doesn’t stop here! After the recent overwhelming response for Marin County Humane Society, we would like to call on our friends and businesses, locally and across the nation to contribute, spread the word, and help out however you can. While we do not currently have an auction in place for this situation, you can donate through L.E.A.P, or go directly to the Harrisburg Humane Society at their website. We know through this amazing equestrian community we can come together to help those in need! Lets see what we can do this time! Harrisburg Humane Society will be hosting a local fundraiser for the 29 Morgan Horses recently seized with a Spaghetti Supper Benefit. It will be held on February 16th, 2013, from 4pm to 7pm at the Hummlestown Fire Hall. For more information, and a direct link, please visit the Harrisburg Humane Society , or to purchase tickets please go to http://www.humanesocietyhbg.org/Page_53.html. After a seven-hour hearing on January 24 detailing severe animal neglect, an independent Hearing Officer today ruled that Marin Humane Society Animal Services, a division of the non-profit Marin Humane Society (MHS), properly rescued two mares named “Blackie” and “Nutsie” from Gray Fox Farm on January 4. 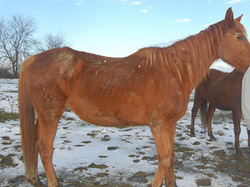 The ruling comes on the heels of a January 14 decision which found that MHS was justified in the seizure of a badly wounded stallion and a malnourished mare from the same property on December 27, 2012. MHS continues to monitor the remaining animals at the Chileno Valley breeding farm occupied by Jill and Alex Burnell. MHS Animal Services Officers visited Gray Fox Farm on December 27 to find severe neglect, injuries, and inhumane living conditions for horses living on the property. Two horses known as “Romantic Star” and “Pookie” were taken by MHS on that date. After the Burnells failed to respond to a care agreement and its deadlines for veterinary and hoof care for some of the horses, MHS returned to the property on January 4 to find the problems were ongoing, and more horses were in need of prompt attention. Animal Services Officers could see that there were still very thin horses on the property and a lack of sufficient pasture or feed. There were bushes stripped down to bark, indicating that the horses were suffering from extreme deprivation of food, forcing them to eat anything they could find. Officers found that Nutsie and Blackie were particularly affected to the point of near starvation. Nutsie had no fat across the crest of her neck. Her shoulder blades and withers stood out prominently. Blackie’s shoulder blades, backbone and hip bones stuck out. With a thick heavy coat, officers could still see all her ribs. Officers could feel no discernible fat behind Blackie’s legs, on her chest or above her crest. Her neck was sunken in dramatically. Humane officers have a duty and the authority to remove animals if it is deemed that prompt action is required to protect their health or safety, or if the officers believe animal cruelty is being committed and a seizure is necessary.